Bones are an essential part of our body that constitute the entire human skeleton. We literally cannot function properly owing to its poor condition or complete absence as they provide overall movement to the body. Most importantly the marrow inside our bones contributes in producing blood cells. Moreover, bones aids various metabolic functions like acid-base balance, detoxification, mineral storage and much more. When not taken care of, it causes rheumatic or musculoskeletal conditions that comprise over 150 diseases and syndromes. 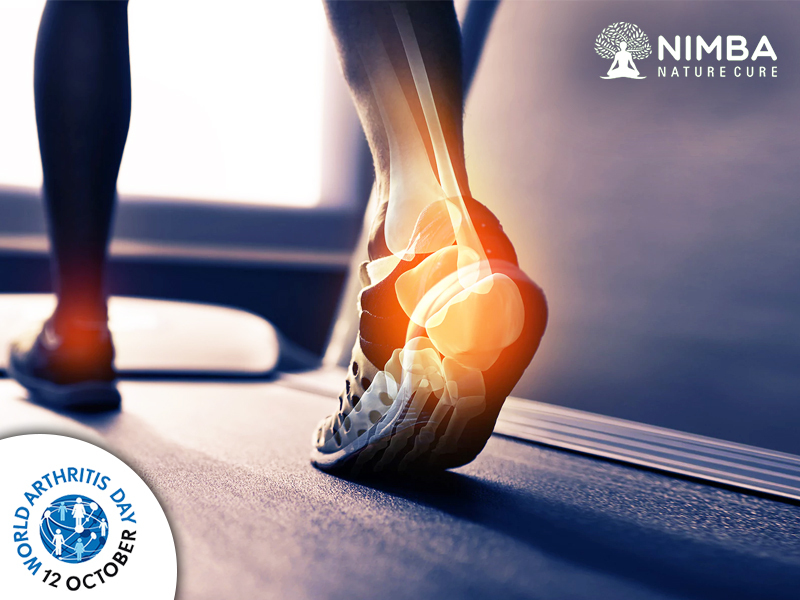 On the occasion of World Arthritis day 2017, Nimba pledges to spread awareness regarding bone health. Arthritis is a paralyzing disease that causes inflammation of joints due to thinning cartilages that support bones’ movement. It results in swollen joints, physical disability, spinal disorders, anemia, fatigue and also fever in some cases. Regardless of the age or gender, arthritis like osteoarthritis, osteoporosis, spinal disorders and rheumatoid arthritis can affect anybody. Rheumatoid arthritis is an advanced and more severe version of the disease that damages not just bones but skin, lungs, hearts and blood vessels as well. World Arthritis Day 2017 is dedicated by Nimba to apprise you of the naturopathy treatments for Arthritis and how to change the lifestyle that profusely affects bone health. Enormous salt consumption: Salt is good for our body but in limited amounts. An excess amount of salt can lead to osteoporosis and bones may even fracture because the body has a tendency to release calcium in order to eliminate extra salt from the system. It is advisable to limit your salt intake to just 5-10gm/day. Sodas and Fizzy Drinks: Cold drinks as we name them and swill down delightfully have a lot of phosphorus that hinders calcium consumption by our body. It is also known to lower the magnesium levels as well – a much-needed element for bone health. Excessive coffee consumption: Coffee as per researches lowers the calcium absorption and conversely leads to its loss. That extra Chocolate: Although chocolate is considered to have flavones and calcium, it also contains oxalate which inhibits calcium absorption. Western Diet: Full of excessive sugar, fats, and refined grains, western diet doesn’t suit our systems and doesn’t replenish our body with the essential nutrients. Alcohol: Too much consumption of alcohol leads to hazardous health conditions like liver damage, cancer, high BP and osteoporosis. Yoga has been a panacea for various ailments in our body, since ages. When performed regularly, it strengthens our internal organs and bones; provides flexibility and focus. It attenuates muscle and joint aches, relaxes the body and refreshes your mind. Here are a few yoga postures to perform daily to relieve those soaring joints. If you have a busy life and don’t have time to inculcate Yoga, go for naturopathy treatments for arthritis. Opt for naturopathy for back pain and to cure knee joints. While knee pains occur due to weathered kneecap or excess uric acid assimilated in the joints, back pain generally originates due to poor posture and bad eating habits. Naturopathy heals your spine and cartilages through deep tissue massages and teaches you how to eat satvik food, maintaining the balance of all the essential nutrients. With a belief that our body is capable of healing itself just by maintaining the optimum balance of mind, body and soul; Nimba Nature Cure Village – one of the largest naturopathy centres in India, helps cure people suffering from Arthritis issues like back pain, knee pain, sciatica, cervical spondylitis, Rheumatoid and osteoarthritis. Their therapeutic massages, organic living, Yoga sessions and the environment encourage you to spend time in the lap of nature and enjoy the richness of wholesome living. Extract some time and book Nimba packages this World Arthritis day 2017 for the superlative naturopathy experience. Heal your joints; heal your soul with Nimba. Please share your comments and contact us for more such therapeutic updates.